On a hot summer day, few activities are more pleasant than a visit to your nearest waterfront to enjoy a cool dip or a stroll along a breezy beach. In my own heavily (de)industrialized city, where the landscape is dotted with abandoned factories, vacant fenced lots, and a few industrial complexes that still produce in the city, Lakeview Park, nestled along the shore of Lake Ontario, serves as an oasis for local residents and weekend visitors from the Greater Toronto Area (GTA); it serves as a much-needed escape from the daily grind of urban life. 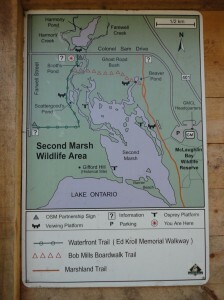 For those who prefer a less manicured scene, a leisurely stroll along the Waterfront Trail will lead to Second Marsh, an environmentally protected wetland. In this context, the outrage of local residents who discovered last month that an ethanol refinery will be built on Oshawa’s harbour, which borders Lakeview Park and Second Marsh, is certainly justifiable. The proposed facility will extend as high as twelve stories, and could attract up to 300 truckloads of corn a day. Longstanding local opposition to this facility is rooted in concerns over the detrimental environmental, social and cultural impact this poses to the waterfront. To date, political patronage seems to have largely trumped local democracy. MP Olivia Chow was the first to bring this issue to the national stage with charges of ‘Conservative cronyism’ when it was recently discovered that FarmTech’s application to build the facility had been approved. When the Oshawa Harbour Commission was reconstituted as the Port Authority, the federal government gained sweeping powers over the harbour, including the right to appoint a majority of its board members. The close and personal links between these appointees, Finance Minister Jim Flaherty, and FarmTech, the company building the ethanol plant, have been well-publicized and may soon be the subject of an ethics probe. City Council is unanimously opposed to the plant; indeed, most elected officials campaigned against it. Opposition to an ethanol plant on the harbour has brought people of all political stripes together to fight a common cause. While there are diverse reasons for fighting this, to date there has been general agreement to stand united against an ethanol plant on the waterfront. Environmental activists have been critical of the lack of environmental assessments completed, while also expressing concern for the fate of the environmentally protected wetland that borders the proposed ethanol facility. Friends of Second Marsh has expressed grave reservations about this project. The Port Authority approved FarmTech’s application despite the fact that approvals subject to Ontario’s Environmental Protection Act (EPA) and the Ontario Water Resources Act (OWRA) have not been received. Furthermore, the federal environmental assessment was cancelled. Under omnibus Bill C-38, the Canadian Environmental Assessment Act was repealed; according to the new legislation, FarmTech no longer requires an environmental assessment for its proposed ethanol refinery. Social advocates have criticized this as an attack on the poor and working class, globally and locally. In the food versus fuel debate, critics of corn-based ethanol argue that diverting crops from food to fuel production increases food costs and could directly contribute to growing global hunger. A UN Report on World Hunger warns “(d)emand from consumers in rapidly growing economies will increase, the population continues to grow, and further growth in biofuels will place additional demands on the food system.” As a drought in the US pushes up food prices, Europe and the United States are facing political pressure to review their biofuel policies and adapt their targets. Corn farmers, however, can be a more powerful source of political pressure within the domestic political scene. On a local scale, Oshawa’s waterfront is rather unique as one of the few cities along the northern shores of Lake Ontario, aside from perhaps Hamilton, where property values generally decrease as they near the water. This is very much the product of the city’s postwar development and industrial history. When farmland was purchased near the lake to build a new General Motors assembly “plant” (part of a larger corporate strategy in North America to rebrand the factory), many working-class neighbourhoods sprang up around it and across the rapidly expanding city. A tradition of social and political activism also grew in this period, coalescing in the construction of affordable public housing around the lake. In recent decades, millions have been invested in cleaning and restoring the waterfront to its “natural” beauty, while environmental activists have been successful in preserving some of the area’s wetlands. For the many people in Oshawa who cannot afford cottages, summer homes, private lakefronts, regular – or any – vacations, the lakefront is a much-needed refuge from the daily grind of working for a wage or living in cramped urban quarters. Poverty has not been as visibly racialized in Oshawa as it has in other cities, if only because the city remains largely populated by peoples of British and Eastern European decent. Yet Lakeview Park is a virtual sea of diversity on a sunny summer weekend. A quick canvass of the park would reveal that many are visitors who do not actually live in Oshawa. They come from across the GTA to relax, picnic and swim with families and friends; they co-exist effortlessly alongside cyclists, hikers and local residents walking their dogs along the 9 km Waterfront Trail – all seeking a more scenic view than brick, concrete and plaster. A serene and peaceful external environment can have a powerful internal effect. For many I have spoken to, this is the most basic reason for the widespread opposition to an ethanol plant on the harbour. They may not be opposed to ethanol in general, but they do not want it on the waterfront. Some fear it will intrude on the scenic vista of Lake Ontario, some worry about odour and noise emissions, some are concerned about a further depression of property values in the city’s south end, and others worry this will negatively affect city plans for a mixed-use waterfront, where small business and residential areas rest alongside parks and nature trails. City Council, for example, has not taken a stance against the use of ethanol in general; indeed, they have searched for and found a willing home for the ethanol facility in Brock Township. Regardless of the many and varied reasons people have for opposing on ethanol plant on the waterfront, the Harper Conservatives and federally-controlled Port Authority aren’t listening. Despite widespread opposition, FarmTech’s application has been approved, and construction is slated to begin in the near future. For anyone interested in getting actively involved in this issue, there are a number of options: sign and share the online petition; contact noethanoloshawa@gmail.com or join the Facebook group Friends of Oshawa’s Waterfront for updates on activities; contact Friends of Second Marsh to learn more about conserving our Great Lakes Wetlands. Christine McLaughlin is a PhD Candidate at York University and co-editor of ActiveHistory.ca. Great post, Christine – you raise some pretty convincing points here! This summer, I had the pleasure of being at Lakeview Park for a wedding and reception. It really did feel like the city’s backyard: diverse, bustling, and a true oasis in a pretty industrialized part of the city.